Although inheritance taxes are of growing importance for Western economies in raising government revenue, little is known about how inheritance taxation affects individuals’ incentives to work. This column explores how much additional labour income tax revenue from heirs the government can expect to obtain for each euro of revenue raised directly through inheritance taxes. It concludes that additional labour tax payments from heirs, resulting from an increase in bequest taxes, are of sizable magnitude and should be taken into account in fiscal planning and welfare analysis. Inheritances are of growing importance for Western economies. Using data from France, Piketty (2011) shows that the annual flow of inheritances has been ever increasing since the 1950s, so that in 2010 it amounted to roughly 15% of national income. This development clearly highlights the increasing power of an inheritance tax in raising revenue. Yet to date, inheritance-tax revenue in most Western economies is rather low. In several countries, inheritances are not taxed at all. In others, including the US and Germany, inheritance taxes exist, but very high exemption levels ensure that most inheritances remain untaxed. Nevertheless, the desirability of inheritance taxation is a prevailing topic in the scientific and political discussion, where popular labels such as ‘death tax’ or ‘Paris Hilton tax’ mirror the emotionality of the debate. In practice, we know very little about how inheritance taxation affects individuals’ incentives to work, to accumulate wealth, or to engage in entrepreneurial activities. Understanding these effects, however, is crucial for a comprehensive welfare assessment of inheritance taxes. Kopczuk (2013) attributes this lack of evidence to the fact that empirical measurement is difficult, because “[wealth transfers] are infrequent (at the extreme, occurring just at death), thereby allowing for a long period of planning, making expectations about future tax policy critical and empirical identification of the effect of incentives particularly hard” (Kopczuk 2013: 330). For testators, higher inheritance taxes make them poorer and make leaving bequests more expensive. Hence, they will experience substitution and income effects (Hines 2013). For heirs, a higher inheritance tax rate leaves them with a lower net inheritance, thus leading to an increase in labour supply if leisure is a normal good. In our recent paper (Kindermann et al. 2018), we make progress on understanding and quantifying the second effect, namely, the labour supply channel of heirs. From the perspective of public finances, this is a particularly interesting channel, as rising labour earnings of heirs will inevitably lead to an increase in their labour tax bill and, hence, boost government tax revenue. We therefore tackle the following policy question:for each euro of revenue raised directly through inheritance taxes, how much additional labour income tax revenue from heirs can the government expect to obtain? Answering such a question purely on empirical grounds is difficult. One fundamental problem is that inheritances could be anticipated and therefore might already shape labour earnings prior to their receipt. Such anticipation effects can get in the way of a clean identification of the effect of inheritance taxes on heirs’ labour. Estimates of labour supply changes upon the arrival of an inheritance would therefore (most likely) be biased. To overcome such problems, our paper uses an alternative strategy, exploiting the existing clean evidence on the wealth effect of lottery gains on labour income. From a researcher’s perspective, lottery wins have the advantage that they occur with an almost-zero probability. Hence, anticipation effects are unlikely to occur and observed differences in labour earnings between winners and non-winners of lotteries (or winners of different amounts) can be directly attributed to the differential receipt of unearned income. Using this approach, Cesarini et al. (2017) document a significant reduction in labour earnings following the receipt of a lottery win. Precisely for the reason that inheritances are (to some extent) anticipated, one cannot directly extrapolate this evidence to answer our policy question. Instead, we use a hybrid approach: we calibrate a large-scale life-cycle model — featuring consumption, labour supply and savings decisions, heterogeneous labour productivity profiles, and realistic expectations about the size and timing of bequests — such that the model replicates the quasi-experimental evidence on lottery wins. Specifically, we distribute lottery gains of different sizes among individuals of different ages in our model in the same way as they are distributed in the dataset of Cesarini et al. (2017). We measure the resulting responses in labour earnings and set preference parameters in a way that the model’s predicted response in labour earnings matches the empirical one. 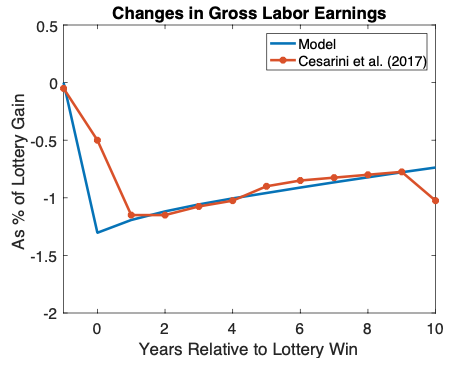 Figure 1 compares the average model-simulated response in labour earnings after a lottery win to its data counterpart. We otherwise set the parameters of our model such that it resembles the German economy, with its progressive tax system, pension payments, as well as labour earnings profiles, and conditional bequest distributions. The only feature of our model, for which neither quasi-experimental evidence nor survey data provide us with clear guidance for calibration, are individual expectations about whether they will receive an inheritance, and of which size this inheritance will be. From a theoretical viewpoint, different assumptions on rational expectations can be consistent with the data on actual inheritance cases. To deal with this issue, we consider a general class of expectations that captures two special cases as polar outcomes: (i) full information in the sense that individuals know for sure how much they inherit and the only remaining uncertainty is about the date at which their testator dies; and (ii) no information in the sense that heirs only observe the cross-sectional distribution of inheritances and form their expectations accordingly. Besides these two polar cases, we consider convex combinations of the two. Equipped with this quantitative model, we conduct the following policy experiment: we let the government levy a proportional tax of 1% on all inheritances in the economy and calculate by how much individuals adjust their life-time labour income in response to this policy change. We then evaluate the impact on public finances through increased labour tax payments. For our benchmark economy, we find that any euro of taxes the government directly raises from the taxation of inheritances is accompanied by an additional nine cents of labour tax payments from heirs (in present value terms). This result is, by and large, insensitive to the assumptions we make about how informed individuals are with respect to their inheritances, as long as expectations are rational. 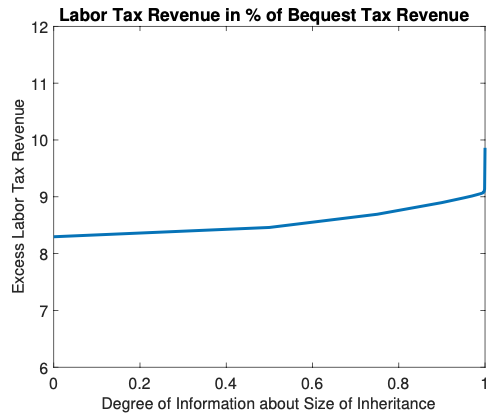 Figure 2 shows the excess labour tax payments as a function of how informed agents are about the size of their inheritance. The number varies between around 8.5 and 10 cents. We also show that anticipation effects are indeed likely to bias empirical estimates that rely solely on labour supply changes starting from the date inheritances are received. Our model suggests that about 48% of the total effect of bequest taxes on heirs’ labour earnings occur prior to the receipt of an inheritance. This highlights the importance of considering a structural model in which inheritances are rationally anticipated. We conclude that additional labour tax payments from heirs, resulting from an increase in bequest taxes, are of sizable magnitude and should be taken into account in fiscal planning and welfare analysis. Cesarini, D, E Lindqvist, M J Notowidigdo and R Ostling (2017), “The effect of wealth on individual and household labour supply: Evidence from Swedish lotteries”, American Economic Review 107(12): 3917–3946. Hines, J (2013), “Income and substitution effects of estate taxation”, American Economic Review: Papers and Proceedings 103(3): 484–488. Kindermann, F, L Mayr and D Sachs (2018), “Inheritance taxation and wealth effects on the labour supply of heirs”, NBER Working Paper 25081. Kopczuk, W (2013), “Taxation of intergenerational transfers and wealth”, in AJ Auerbach, MF Raj Chetty and E Saez (eds. ), Handbook of Public Economics Vol. 5: 329–390, Elsevier. Piketty, T (2011), “On the long-run evolution of inheritance: France 1820–2050”, The Quarterly Journal of Economics 126(3): 1071–1131.